Panjab and Haryana High Court Clerk Admit Card out for CPT- Download online Call Letter for computer proficiency test Download PDF . Computer Proficiency Test shall comprise of two parts. Part-I: Word Processing Test, the candidates will have to qualify Computer Typing Test in English at the speed of 30 W.P.M. 2. In the home page the candidates have to follow the given link: Admit Card Login – Stenographer Haryana. 3. After clicking, the candidates will be redirected to Login page. 4. Here Candidates have to mention their Registration ID and Password and then click on Login. 5. 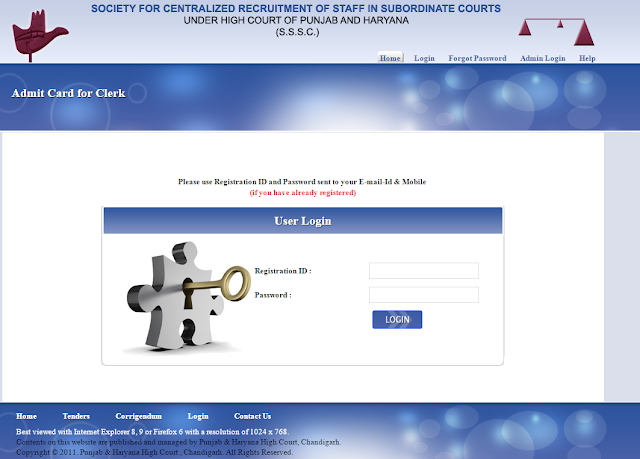 After that, the candidates will be able to download the Admit Card for the shorthand test.